We Love providing Guinot institute Paris facials & Body treatments which are complimented by an extensive range of Guinot retail products to purchase in our Bristol Salon. We have many regular repeat customers whom have chosen pamper Me for our relaxed atmosphere, great service and competitive prices – and we frequently have offers on Guinot. Guinot Age Summum Treatment is the alternative to plastic surgery for treating immediately signs of ageing : wrinkles and fines lines, loss of firmness, lack of radiance. 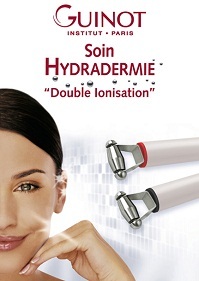 Guinot created the patented Thermoclean heating electrode specifically for this treatment. Instead of using steam to soften the pores (that can dry out and damage skin and with which you cannot regulate the heat), this electrode is set to a specific temperature and can be adjusted to each person’s comfort level. While softening the pores, the heat from the electrode simultaneously penetrates the treatment gels deep into the skin. 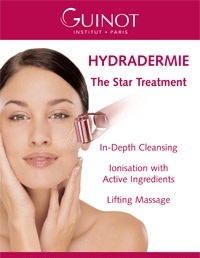 Hydradermie 2 we are pleased to announce that we have upgraded our Guinot machine and now offer the NEW Hydradermie 2 Facial, this is a spectacular facial which uses mild electrotherapy to extract impurities and toxins that build up in the skin over time. The Hydradermie2 uses ionising, galvantic and oxygenation technology to deeply cleanse and restore your skin to it’s natural beauty. Regain a radiant and luminous complexion, the Hydradermie treatment with its Sérum Gel Hydratation is the ideal treatment due to the removal of dead cells from the skin.The hydration programme restores radiance and gives a glowing complexion. An hour of treatment, during which precious active ingredients will work to rehydrate the skin, and help reinforce its natural protective mechanism and improve its suppleness. As soon as the treatment is over, your skin will feel more hydrated and comfortable. 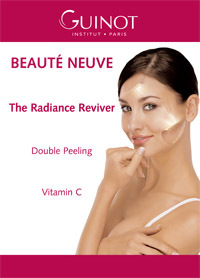 Your skin will have regained its radiance. Proven results: 52.3%* more hydrated skin *Clinically proven results. Duration approx 50 mins. 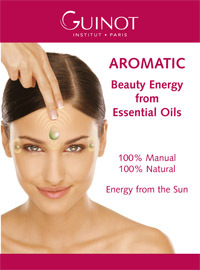 You will feel incredibly relaxed and your skin will regain its suppleness, radiance and softness. The treatment ends with a plant extract mask, from which your face will emerge new and radiant. At the end of the treatment your skin is more luminous and comfortable. Your face appears healthy and well rested. Duration approx 45 mins. Turn over a new leaf in less than an hour… Beauté Neuve is a treatment which removes the dead cells responsible for dull complexions and reduces the appearance of brown spots. 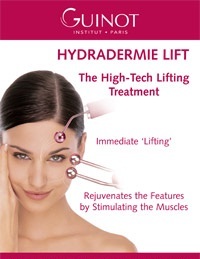 Create a natural temporary facelift effect by lifting features through facial muscle stimulation.After the first treatment, you will see the visible results of lifted facial features. The skin has regained its tone and surface wrinkles have faded. This method is like “body building” for the face! How it works – Biopeptides, in the Serum Gel Anti-Rides, which recreate the skin’s elasticity, combined with the stimulating effect of special currents, allowing for facial muscle stimulation. To visibly rejuvenate the eyes, eyelids and crow’s feet, Hydradermie Lift Yeux stimulates and contracts sub-cutaneous muscles. Plumping muscles, increasing volume and filling in surface signs of ageing. From the first treatment wrinkles around the eye contour have faded. The skin is smoothed and the eye contour looks younger. In a less than an hour, use the best anti-ageing technique to visibly rejuvenate your face. Hydradermie Age Logic redensifies the skin, revitalises and smoothes wrinkles, with results visible after the first treatment. More than just a rejuvenating effect, the treatment combats the signs of ageing. You will visibly see that the signs of ageing have faded on your skin. Your face will have regained firmness and radiance. Proven results: 53.4% decrease in wrinkle depth – Results clinically proven by measuring the depth of wrinkles.